Around a thousand people, from across the country and around the world, attended the religious service at Akdamar Church yesterday. Several hundred people attended yesterday's religious service at the Akdamar Church located on an island in Lake Van. The church was opened with the special approval of the Culture and Tourism Ministry for religious services for the first time in three years. 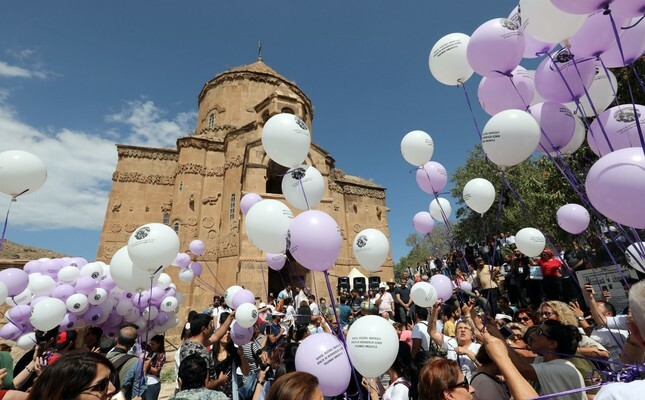 The first religious service was held at the Armenian Orthodox church in 2010, it repeated annually until 2015 when such gatherings before suspended due to increasing terrorist threats in the east by the PKK. Hundreds of people, who came from both abroad and from across Turkey, made the journey to the shores of Lake Van yesterday morning, before being taken to the island by boat. The Van Provincial Department of Tourism, the local commerce office and some nongovernmental organizations distributed leaflets promoting the region. Aram Ateşyan, the acting Armenian Patriarch, led the service. Also in attendance was Culture and Tourism Minister Mehmet Nuri Ersoy. A significant numbers of security personnel, bomb detecting dogs and other measures were deployed near the lake and on the island during the services. The Akdamar Church, also known as the Cathedral of the Holy Cross, Aghtamar and Surp Haç, was built between 915 and 921 A.D. by architect Bishop Manuel under the sponsorship of Gagik I Artsruni of the Kingdom of Vaspurakan. After the 1915 incidents during World War I, when hundreds of thousands of Armenians and Turks were killed, the church was abandoned. The building's restoration began in 2005 and opened as a museum two years later. The Ministry of Culture and Tourism approved a TL 4 billion (around $3 billion in 2005) budget for the project, which lasted two years and included several architects, engineers and archaeologists. Believed to be constructed to house a piece of the "True Cross," which was used in the crucifixion of Jesus Christ, the church was restored in 2005 and opened in 2007. The church is open to visitors as a museum but crowded events were barred as acts of terrorism escalated in Turkey's east and southeast where the PKK was active. After a brief lull, the PKK, which has conducted a campaign of terror in the region since the 1980s, had resumed its attacks in 2015. Counterterrorism operations since have reinstated safety in the region, which is dotted with prominent sites for Christianity and Islam. The ministry allows the church to serve as a house of worship one day a year. Speaking to Anadolu Agency after the ceremony, Ashot Mazukyan, who came from Armenia with a group of 40, said he was happy to attend the service in the lands of his forefathers. "I had attended the service 6 years ago. I am happy to have repeated the journey." Ani Karapetya said it was her first time. "I am experiencing a whole range of wonderful emotions. I am very happy to have come here. My grandfathers lived here. I would like to thank everyone who helped making this service happen." Meryem Delge from Istanbul, who was part of a group of 80, said, "I can't even describe how I am feeling. We will pray all together for all and for our country." Ateşyan, speaking earlier this week, said attendance at the church in 2011 had reached 7,000. "We don't expect such a high number this year but it will be huge even if only 2,000 people show up," Ateşyan had added.